Puppies are so much fun and adorable and every one wants to hold, up until they start biting and chewing on you. This is where the phrase “you can’t teach an old dog new tricks” comes to life. 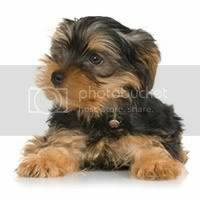 If your yorkie starts biting you for whatever reason then you should definitely start on discipline. Failure to it will lead to serious consequences when they are older. Puppies are trainable during the first six months of life as they are new to different situations and open to correction. Past this age, discipline becomes very hard to instill which may lead to even severe consequences. That said, there are some very effective ways that you could use to stop a yorkie from biting. One of the best ways to train a puppy is by setting boundaries around the house. It is important for your yorkie to have a crate. This creates a place for them to call their own, this is their territory. Let them stay there when need be, for instance sleeping then let them out later when they need to play. Your puppy should know that the other part of the house should be respected. The crate is where you send them after they misbehave in order to show that you are not pleased with their behavior. If you leave the little guy to run around the whole house then they will definitely feel that they could do whatever they feel like. The crate system is simply to induce discipline by teaching the yorkie the value of restriction. r this. Try sending him to his crate immediately he does this. This way, he will know that he is being punished and will likely not repeat it. It is important to note that such corrections should be done immediately the mistake is done. This is because dogs have very short term memory and disciplining them later will be futile. This is because they probably won’t remember what they did to deserve the punishment later. Biting in yorkies is a good sign of teething. Remember, the little guy is just like an infant and is undergoing the same milestones. In this case, he might be teething and needing something to sooth his gums with. In this case, buy him some teething toys like a toy bone. This is an excellent play time toy for him and will as well help soothe his itchy gum. You may find that this is your only measure to stop him from biting. Dogs, and in this case puppy are playful in nature and get very excited on seeing you. In most cases, you are happy to see them too. Sometimes, this excitement might be hard to control for them and this is when the biting happens. Immediately this happens, withdraw all the attention and send him to his crate if necessary. If this happens every time you get home, you should probably try ignoring him for the first 15 minutes or so. This will teach him to control himself in the future. It might be hard for you to be strict and harsh to your yorkie but remember that he needs you to instill discipline in him. No matter how hard it is do so. Failure to which might end up with you dealing with a very fierce dog in the future that has no discipline. When this happens, you might as well say goodbye to all your visitors.